Police officers and CCW holders around the nation rely on Speer's acclaimed Gold Dot bonded hollow points for self-defense. 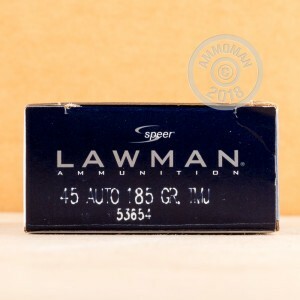 To help shooters practice more effectively, Speer created the Lawman series of total metal jacketed practice ammunition, each of which shares identical ballistic properties with its Gold Dot counterpart. 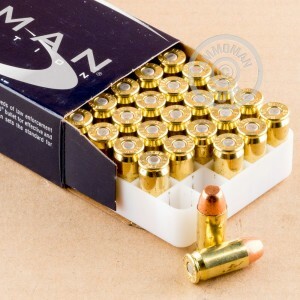 This .45 ACP Lawman ammo replicates the performance of the .45 ACP Gold Dot load. As such, it is suitable for use in a wide variety of .45 Auto pistols ranging from the tiny Springfield XDs to the full-size 1911. These rounds, packaged in a case of 1,000 with 20 boxes of 50 rounds each, use non-corrosive Boxer primers, reloadable brass cases, and a light 185 grain total metal jacket bullet. The bullet design results in the same above-average velocities and flatter trajectories much like the 185 grain Gold Dot hollow point, producing a higher-fidelity range experience than 230 grain ball ammo. Total metal jacket ammo covers the base of the bullet, reducing lead exposure for enhanced safety in all shooting environments. However, it is not suitable for use in ported barrels, which may shear the plating. No problem for CCW shooters! AmmoMan.com ships this case, and all orders over $99, for free.